LORD KUBER - is the lord of wealth & prosperity in Hindu Mythology. Worship of Kuber brings pros..
LORD KUBER - is the lord of wealth & prosperity in Hindu Mythology. Worship of Kuber brings prosperirty, wealth and money and reduces unwanted expenses and assists in flourishing of your business. 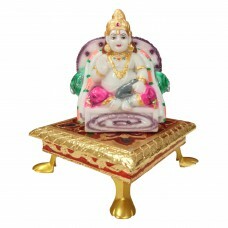 Made of A+ Quality of Resin, which gives look like marble statue. 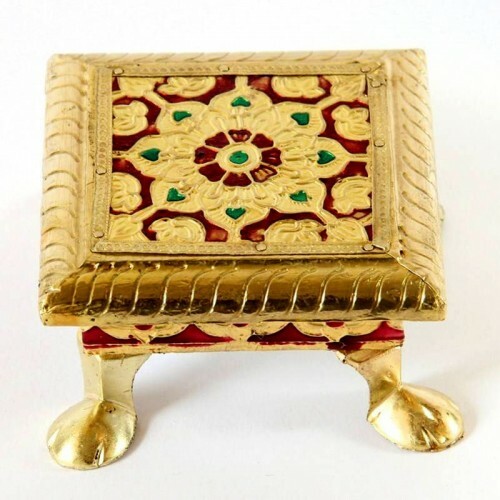 CHOWKI - This Majestic Golden Meenakari Chowki is a Perfect Seat (Chowki) to Peace your Lord Kuber. The Base of this Chowki is Made of Wood, Then Further Covered with Golden Meeenakari Sheet, Adorned with an Auspicious Floral / Rangoli Design.